Welcome to the Lender Liability Lawyer online Media Room. We include here resources to help journalists and their news outlets in their coverage of lender liability lawyers Brian Mahany and Chris Katers. Chris Katers and Brian Mahany are available for comment on any of the subjects listed under Areas of Expertise. 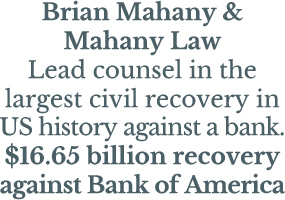 Lender Liability Lawyers In the News section includes a sampling of recent coverage of Brian Mahany and Chris Katers and the clients they represent. Elite Lawyer Management represents Brian Mahany and the Lender Liability Lawyer team so please contact us if we can provide information or set up an interview with Chris or Brian.